Quilter's Cottage staff makes customers feel welcome and special the moment they enter the shop. We are located in Richmond, Texas - a friendly, small town rich in Texas History and Western Culture. The Cottages are approx. 3,000 square feet and occupies 2 buildings in a historic strip center The Country Village created from old homes that were moved to this location. A nice classroom space is perfect for the fabulous classes, the local bee meetings and the many events on the calendar. Being a dealer for Arrow Sewing Cabinets is so fun, they add a whimsical touch to your sewing room & our shop - coming back soon along with some sewing machines! We are also a proud Aurifil Dealer. 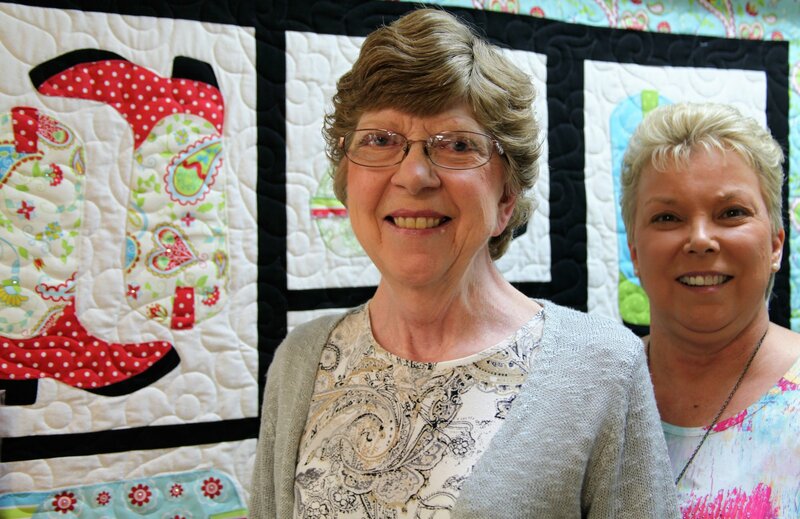 Linda Caraway and Cyn Wilde own Quilter's Cottage and are now sewn together as Sister Friends. Each has their own specialty they bring to make this full service Quilt Shop a favorite with the customers! Enticed by charming vignettes of fabric, kits and samples that mingle with vintage treasures and antiques, quilters love to visit and feel at home. We always make a point of listening to customer requests so we can effectively change and expand our inventory to meet their creative needs. The beautiful hand dyed Batiks Hallway and large Color Room Blenders are our specialty. Full Longarm services are provided and done in-house, using an Innova Quilting System - from basting to binding and everything in between! In addition to clubs, classes, and special events fill the shop's calendar. QC hosts Tucker University & Siesta Charm School, BeColourful Monthly Workshop, several BOM and Demo You-Tubes coming soon on our web page. We have a Rewards System for our shoppers. $30 rewards card earned for $500 retails sales. The shop hosts several bees along with our own bee - Girls Night Out one Friday evening a month from 6pm until midnight! If you are looking to learn or just need someone to make that special quilt for you, come visit our shop! Helping customers realize they can do it it is what we are all about.